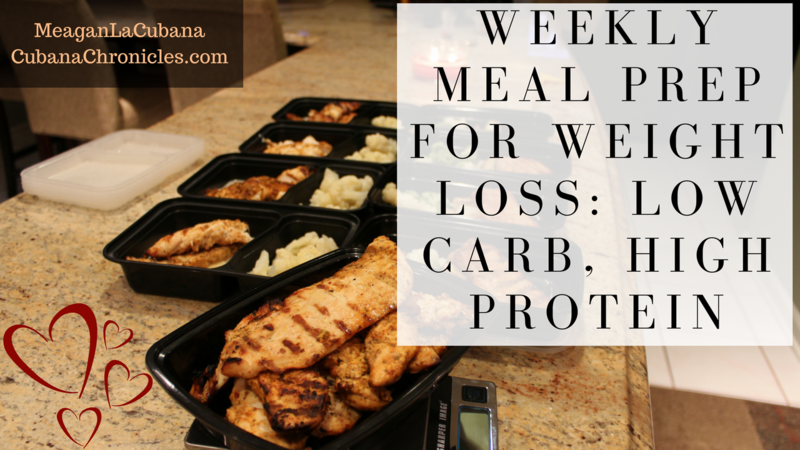 Meal Prep: High Protein, Low Carb Recipes for Weight Loss - Get Results! I’m back with the meal prep for weight loss post! I’m trying to make this a weekly type of post and keep things interesting. This week I prepped for myself since I was home dog-sitting for my parents. I only fully prepped for 4 days, but I have enough leftover chicken for the rest of the week! You can watch the meal prep here, too. Anyway, I decided to go as simple as possible this week for my meal prep. All my vegetables and carbs were steam bags – so they went from the freezer straight to the microwave! It’s just easier to create less of a mess while I’m at my parents’ house. I sweat it’s not as boring as it sounds. Just look at the pictures! I threw this broccoli and cauliflower bag into the microwave, then microwaved this bag of potatoes. In the end I just divided all the veggies into 4 containers evenly, and I weighed out about 3 ounces of boneless, thin pork chops – and BAM! Done. Since I was being lazy, I microwaved cauliflower, mashed cauliflower, and grilled chicken with this. I divided the veggies and evenly as I could (because life isn’t that serious where you have to weigh it all out), and then I weighed out 4 ounces of chicken per container. The longest part might’ve been walking from the grill to the counter inside! HA! I’m not mad about that. 1 packet McCormick Baja Citrus marinade only use water! That’s pretty low carb if you ask me. I’m not aiming for low carb specifically, I just prefer to eat my carbs as snacks more than anything else – so that’s how I plan my meals. I’m not one of those people who is scared shitless of carbs – that’s silly. Carbs are delicious and carbs are LIFE! How can someone live without rice, pasta, bread, cereal, potatoes and all the other yummy carbs? That’s a rant for another post. For now, enjoy the recipe below and the youtube video here.